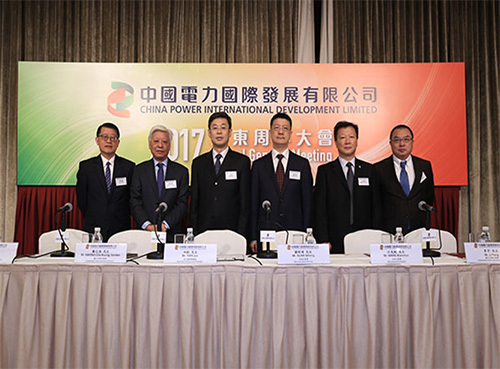 On 5 June 2018, the annual general meeting of China Power was convened in Hong Kong. The meeting was chaired by Executive Director and President of China Power Tian Jun, and attended by Non-executive Directors Guan Qihong and Wang Xianchun as well as Independent Non-executive Directors Kwong Che Keung, Gordon, Li Fang and Yau Ka Chi. At the annual general meeting, eight resolutions in relation to the audited consolidated financial statements of the Company for 2017, the reports of the board of directors and of the auditor of the Company, declaration of dividends for 2017, re-election of directors and re-appointment of auditor were approved. Shareholders were eager to ask questions at the meeting, expressing concern about the operation and development of the Company. Executive Director and President Tian Jun, Vice President Shou Rufeng and shareholders exchanged their views thoroughly in respect of those issues. This has effectively enhanced independent shareholders' understanding on and recognition for the Company's operation and development strategy.